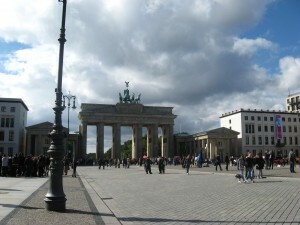 The above picture is of the Brandenburger Tor taken last Saturday. I finally ventured out to the middle of Berlin and saw the Brandenburger Tor, Reichstag, Spree (the river that runs through Berlin) and the Berliner Dom last week. The visit was extremely brief and surprisingly enough, I remembered my way around (I went with a newfound friend, Katie, who was also kind enough to go to the Jason Derulo concert with me last Thursday night). I guess that’s what happens after seeing the sights 3 times already? As for the good news of the week: my students are absolutely wonderful! I haven’t helped teach all the classes I’m assigned to yet, but the classes I’ve been in have all been absolutely lovely. It’s not hard to pinpoint a favorite class at this point because I’ve had more interaction with the Leistungskurs, the mixed 12th and 13th grade class, where the students have chosen English as one of their major subjects to test in for their Abitur (the test that all German students take at the end of their high school career. At least the Germans who are at Gymnasium, one of the four different high schools in Germany.). The Leistungskurs usually is one grade level (12th grade, and another class for the 13th grade). However, my school is so small, that there’s just not enough students to form two classes. Hence, a mixed one. The Leistungskurs is my utmost favorite class because of the level of the students. What have I been doing with them? U, my mentor teacher, has me sit with the two best and most arrogant students in her class (no joke, she told me this), and has me discuss points from the book we’re reading (by the way, the book is Falling Man by Delillo). The book follows an estranged couple through their post-reactions to the 9/11 attacks. What have we really talked about? Politics. The two students are so articulate and intelligent in their discussions about the 9/11 attacks and how terrorism has affected international relations, that I have to ask myself: why am I even here? I’ve told them that twice now. It’s a bit embarrassing to admit this but their ability to talk about politics in English surpasses my German ability to do so. Great week juxtaposed by German bureaucracy and my absolutely amazing students. Hhhmmmm…am I allowed to already call them my students? P.S. I know I broke the promise of posting an extra…well…post, but I’ve been sick with a cold and have had little energy for anything else besides bureaucracy and school. I will keep that promise, though, and post something that is actually a bit more light-hearted! This entry was posted in Jill Nguyen '10, Fulbright to Germany and tagged German banks, German Bureaucracy, German School System, School, the Common Cold. Bookmark the permalink.